Want followers that drop off as soon as the transaction comes through? Followers that look like junk whenever a would be employer examines who follows your newly popular account? By all means, use money you likely don’t have and give it to someone in another country with a follower farm. As my Instagram account is brand new, I tested it out. 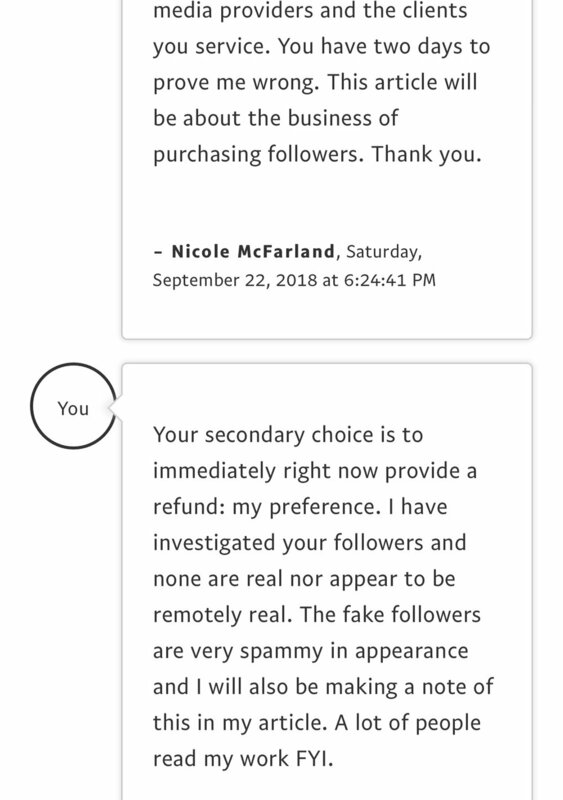 Too many people told me about their being ripped off by fake follower scam artists. Were this something else, I might not care so much. Because it affects people who are actors and musicians, I am deeply upset that people who need money most are being conned out of it, and nobody is doing anything about this crooked trade. 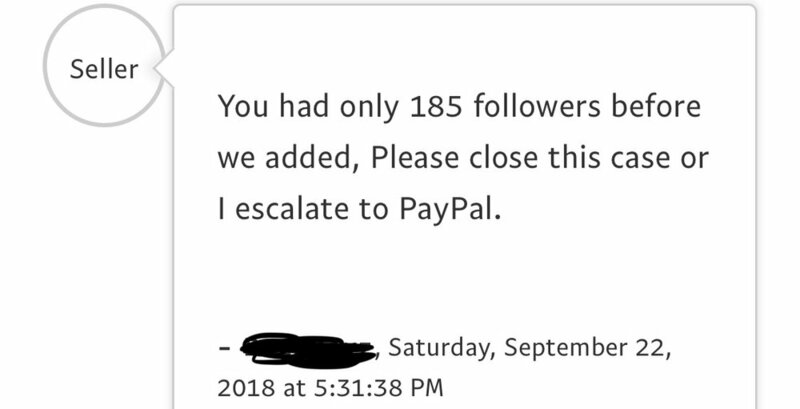 These people should be required to maintain the fake follower counts or be unable to sell through PayPal. Better yet? 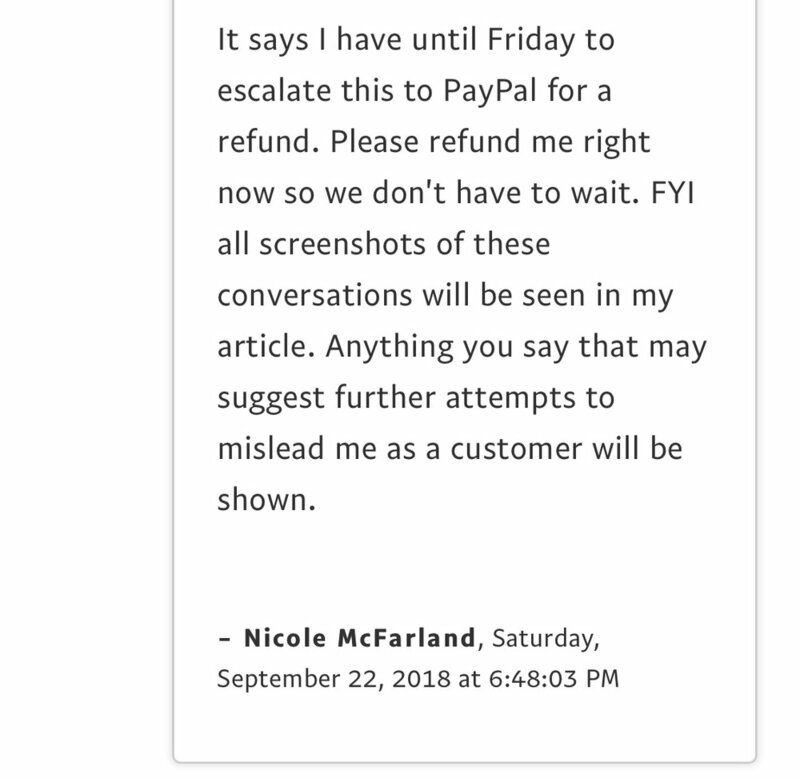 Why doesn’t PayPal ban people selling followers from using its services as they banned Alex Jones? 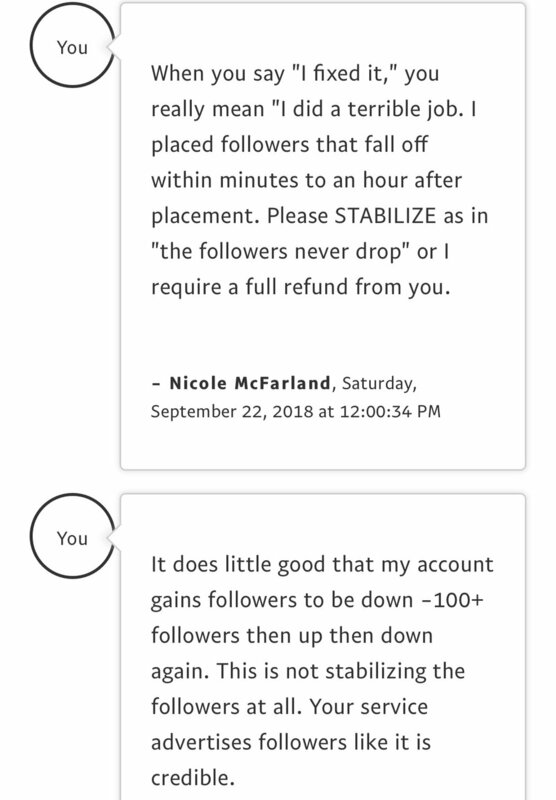 My below interaction getting a refund for fake followers with one company online reflects the greater issue as a whole. NOTE: MY EXPERIENCE IS THE RULE, NOT THE EXCEPTION. The people whose followers don’t drop off must be paying thousands upon thousands of dollars to maintain realistic profiles every month. You will not be lucky. People within the acting community I know have felt pressured to look popular on Instagram. 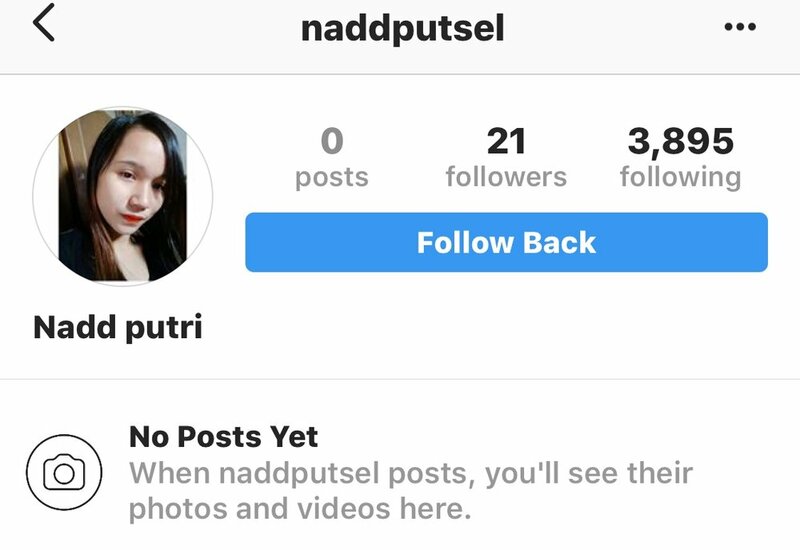 They’ve bought followers…and became unpopular on Instagram again. A theatre gentleman confided in me how upset he was that all of his new followers had dropped. He paid for them—and overnight, when he’d bought them that weekend, they were gone. The actor who told me isn’t rich one bit. He could have used the money towards furthering his career, or buying a sandwich. A sandwich provides energy for your next audition! No, they were gone. How messed up is the entertainment industry that we value fake followers rather than talent? Call me old fashioned. We should be judged by our IMDb credits and/or music releases. Filmmakers, actors, FX folks, musicians, rappers, all of us. 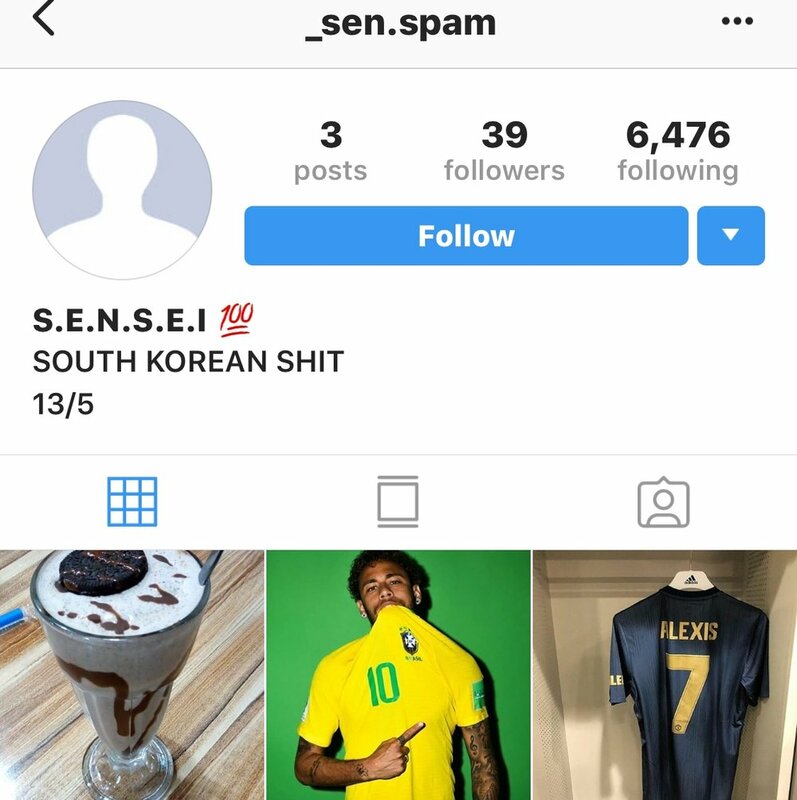 By now, buying fake followers is so common place, why do some brands believe the population of a small European nation follows a style blogger we’ve never heard of on Instagram? Follow farms, friends. Fake likes. Fake followers. And brands empty their wallets. How some major celebrities, and people misleading brands into hiring them who aren’t actually influencers at all, get away buying Instagram followers in the millions is crazy. 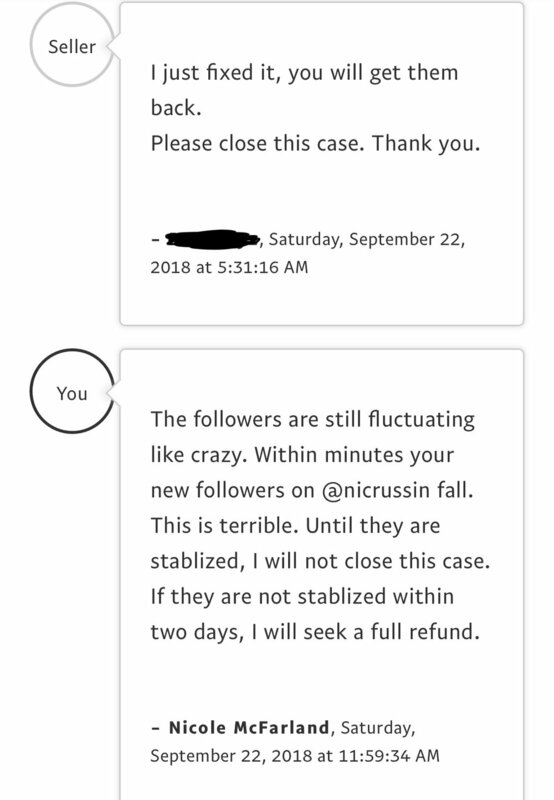 Surely a few Instagram follower sellers do as promised. 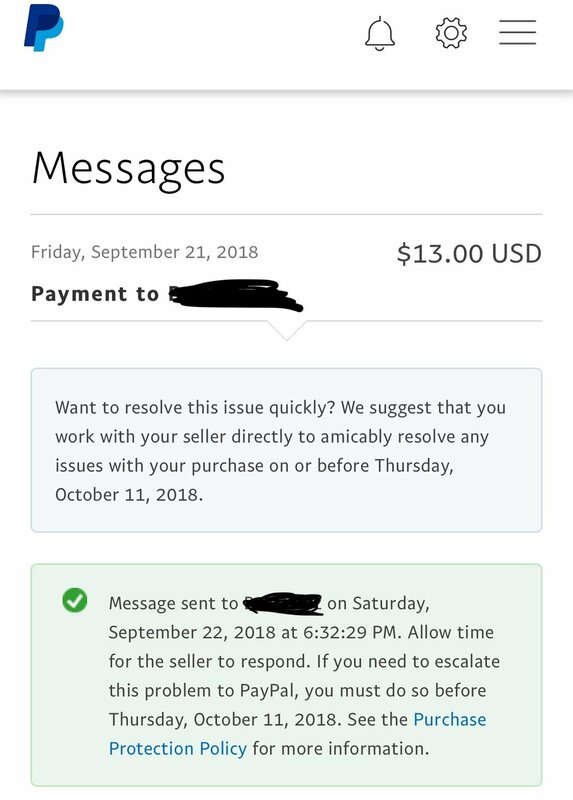 My below interactions are with a non-USA PayPal seller. 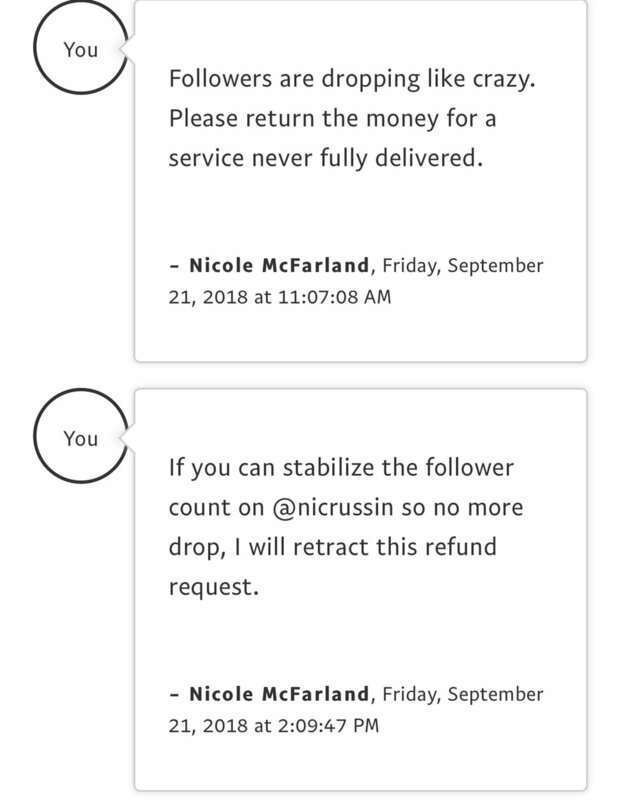 I have chosen to black out their name because they did provide a refund once pressured and refusing to answer my questions. Their company name that rhymes with “fuzz maze” pops up on the first Google results for buying followers. Can you call any of these companies? Hardly. Very often, a person or small group of scammers gets together operating under handfuls of names. 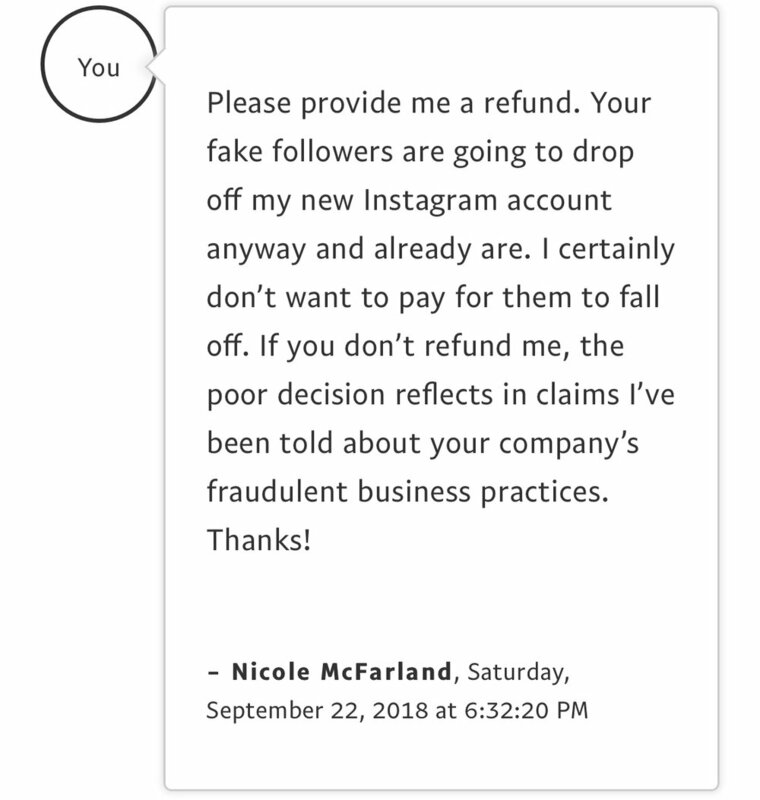 When an actor or actress, or aspiring model for that matter, purchases followers burned out by one fraudulent “company,” they could turn up working with the same crooks again. The fake followers look a little something like these below. My photo info on this post is pretty long yet worth a look. The disturbing thing is how young people, many times minors, get conned into buying disappearing followers. Look at how quickly my fake followers drop off. Does it matter if you figure out this company’s name? Yes and no. By the time you read this post, they may have rebranded under another alias. 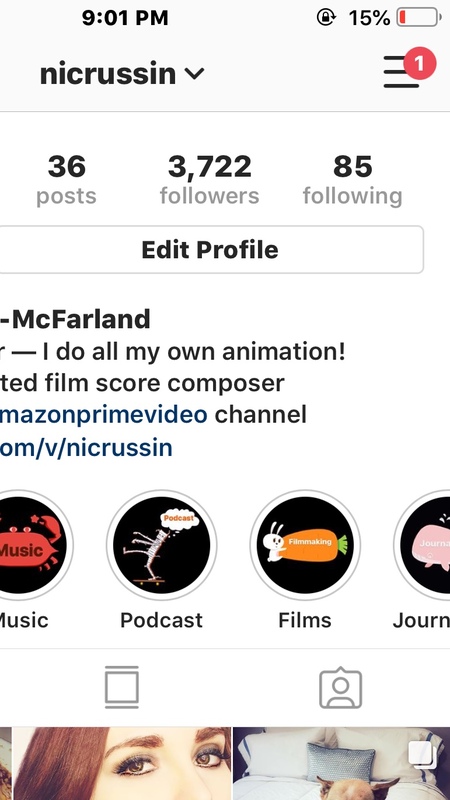 If you’d like to befriend me as a real Instagram user, you may follow me at @nicrussin. Right now, and I can’t promise forever but for the time being, I’m following back people following me who list “actor” or “actress” on their bios and appear legit. One solid way to build real followers is supporting each other in the film world. When you get tempted to buy Instagram followers, know the popularity won’t be there forever. Or for many upset acting community folks, beyond 24 hours. With me, my new fake followers are all probably going to be gone in a week if not later. That’s OK; I have a bunch of real Twitter and Facebook friends. And, my Instagram followers won’t have expletive ridden bios. Be sure to look at the types of fake followers following my Instagram. Not worth the money! For disappearing followers, couldn’t we have cool folks like Nina Dobrev following and unfollowing me within the hour? Look how fast my new fake followers drop! By 10:01 pm…the slow drop! Earlier in the day, fake followers dropped by 100+ within each hour.